I am so excited to share this project with you! 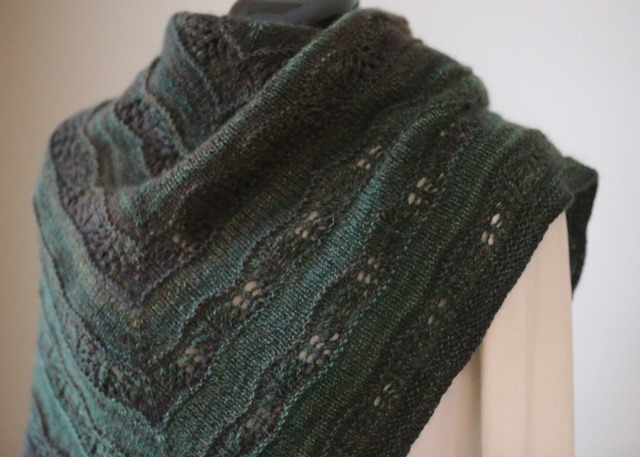 I knit like the wind on it – not wanting to put it down for anything (including spinning!) else. It was one of those ‘savouring’ projects that some along once in a while. You know the ones? Where you stop and admire the yarn? Stretching out the piece on your lap, silently patting yourself in the back for such a great choice of pattern and yarn? 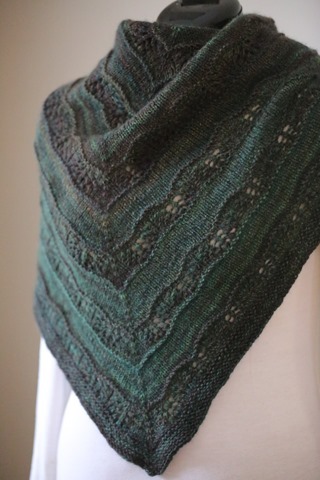 This was definitely one of those rare gem projects that is the reason why I love knitting so much! For this project, I had two 4oz braids of Ancient Arts Fibre Crafts BFL and I divided each braid into three equal sections. I spun each to a separate bobbin and plied, creating roughly 500 metres of traditional 3-ply. 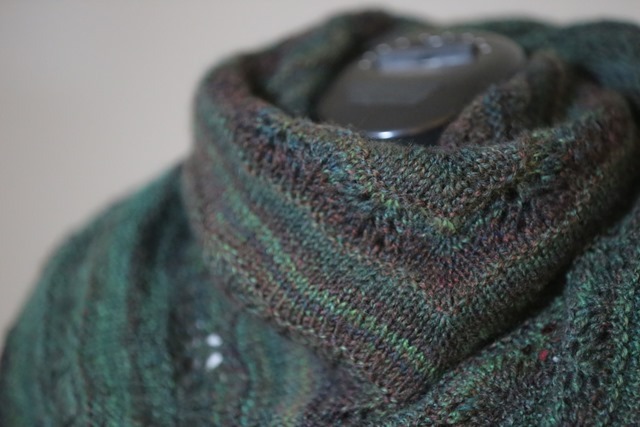 To say I was pleased with the results is an understatement – I couldn’t wait to start knitting with it! So cast on, I did! I think most everyone is familiar with Blue-Faced Leicester (BFL) in processed combed top. It’s one of my favourite spins out there because I love the short forwards draw letting twist between my fingers into the drafting zone. In my experience, this type of top works really well for this because the staple length is slightly longer than merino or some of the other fine wools, which get twist locked really easily and drafting becomes harder when you add twist in the drafting zone. The staple length of BFL is 3-6 inches. The average micron count is 24-28. BFL has a beautiful lustre, is next-to-the-skin soft and takes dye extremely well, which makes is an ideal choice for hand spinners (Smith, 2014). I’m not going to discuss processing a BFL fleece, since that’s not what I have done – I’ve spun processed roving and top only. One of the things I love about 3-ply yarn is the ‘roundness’ of it. While 2-ply tends to lend itself to lace because the two plies naturally roll away from one another creating larger ‘holes’, the three plies tend to roll into themselves, settling into great yarn for stockinette stitch (St st), cables, textured stitches, etc. This pattern has the lace in the beginning of the chart but it also has a lot of St st and I added a garter border since I was going to run out of yarn. 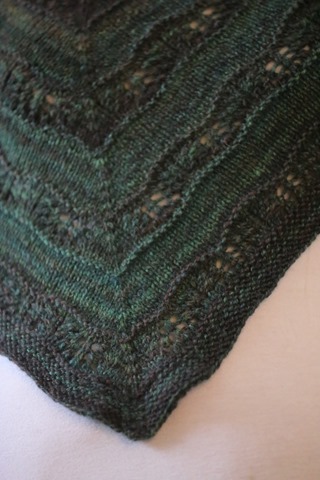 I wouldn’t have been able to finish the lace repeat anyhow. 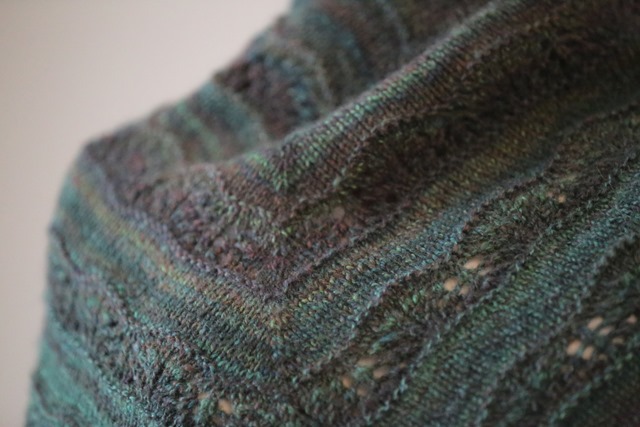 The resultant ripple effect on the edging is due to the lace repeats from the body of the shawl. I think it leaves the shawl looking lovely and understated. The rustic quality of the yarn adds to this aesthetic as well. I mentioned to a friend while I was knitting this that it might actually be my favourite project that I’ve made of all time. I still think this might be the case. 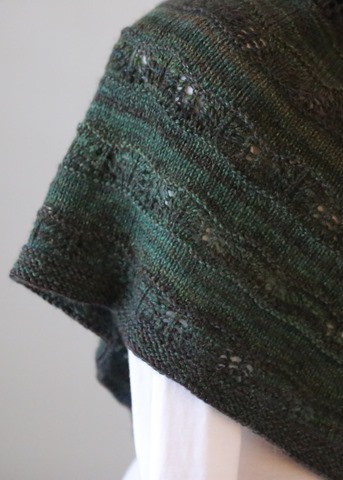 There’s just something very satisfying about this shawl and I just. plain. love. it. Have you finished something that really pushed your happy buttons? If so, what it the yarn, pattern, or something else that made the project or all of it combined? I’d love to hear in the comments! Smith, B. (2014). The spinner’s book of fleece: A breed-by-breed guide to choosing and spinning the perfect fiber for every purpose. Storey Publishing: North Adams, MA. Next Post excitement about heels! So very pretty, the colours are stunning! I’m curious if the colors are capturing the true colors. 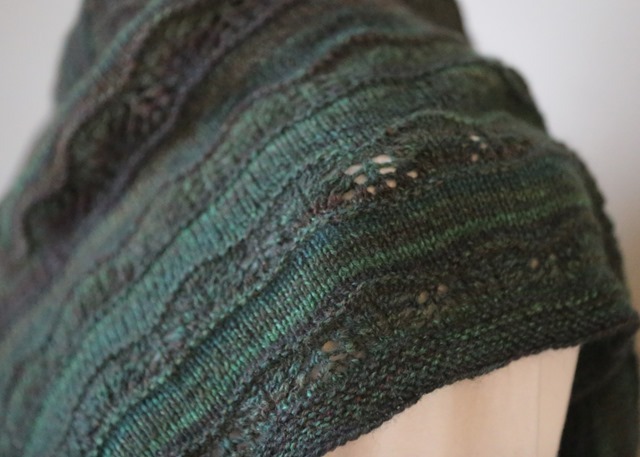 The BFL hand spun seems to show mostly blue tones while the finished shawl appears green. Could you comment? 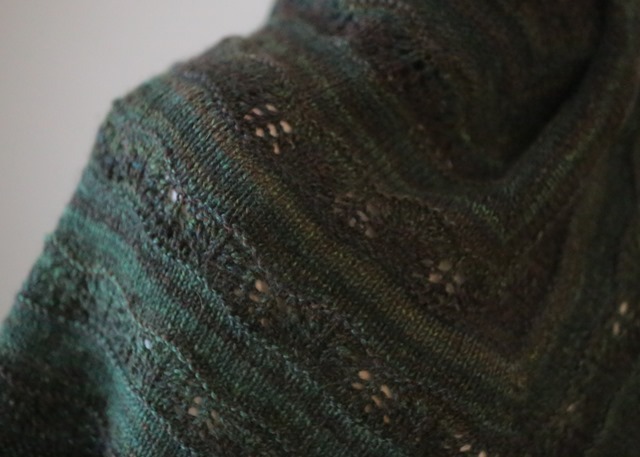 The yarn and shawl are definitely green. There wasn’t any blue in the yarn at all. Maybe just the differences between our monitors? I know that’s a problem.